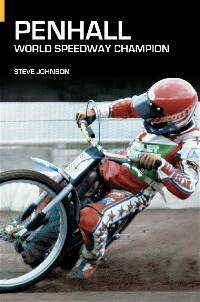 Extract from 'Penhall: World Speedway Champion' by Steve Johnson. The build up to the 1981 World Final at Wembley. Sandwiched between the USA's team and pairs championship events was the most important qualifier of all - the first step on the road to Bruce's goal of becoming 1981 World Champion. Meticulous planning seemed to have left nothing to chance, with confidence high following the superb domestic form and mechanic Mikey was sent out to California two weeks in advance with a pair of bikes to set up. Disaster very nearly struck at the last minute though as the van carrying the race machinery and equipment broke down en route to the final at the LA Coliseum. 'That's the sort of thing that can play with your mind and mentally break you down. I was pretty calm though because I was full of confidence at that time. I was already having an unbelievable year, I was just in that state of mind; I felt that I just couldn't get beaten that season. I think Mikey and Jurgen were in the van and we were in contact with them. They said they would be a little late, but after I spoke to them I was OK, I knew they would be there.' The bikes and mechanics eventually arrived at the track just 30 minutes before the first race but Bruce settled quickly into the journey towards the 1981 World Final. He had barely put a wheel wrong during the entire season before the 5th September 1981, but past form counted for nothing when the tapes went up on a world final. Sixteen riders qualified through their own merits and had five rides for their shot at becoming champion. One hiccup and any hopes were probably out of the window for another year. Bruce travelled to London with Peter Adams and such was the enormous buzz about the showpiece meeting that even the official practice was covered by both BBC and ATV news. They featured racing sequences and interviews with Bruce, by then the bookmakers' favourite at 7-2. He was in constant demand for newspaper and television interviews, and conducted himself as admirably as ever while under the unrelenting media surveillance. He re-iterated his commitment to the promise he had made to his parents; confident that he had what it took, but modest at the same time, publicly rating his own chances 'as good as anyone else's'. The rest of the speedway world had no reason to hold back. He was outstanding favourite amongst all punters, none more so than the thousands of Cradley fans who had booked their tickets for the Empire Stadium. When the big day came, expectancy levels simply soared sky high. A group of around 30 family and friends flew from California, which brought about the first signs of any nerves as Bruce flapped and flustered, trying to allocate everyone their seats in the stands. His American girlfriend at the time, Jodi - a Tennis scholarship student from Texas University, joined his big brother Jerry and his wife. There was sister Connie and her husband Mark, who accompanied Bruce to England in 1978, his aunt and uncle who had taken the family under their wing after the death of the childrens' mother and father, plus Bruce's cousins and other friends including US mechanic, Spike. In charge of the bikes for the event would be both Jurgen and Mikey, along with Steady Eddie Bull. Pete Adams would be at Bruce's side for the entirety and had his own ideas about how to prepare for the meeting. Adams had noticed that his rider always performed better when he was tired, arriving back in England for example after a busy weekend racing on the continent and late night flights, only to score an inspired maximum at Birmingham on a Monday evening. So, after breakfast on the morning of the final, he packed Bruce and Jodi into a taxi and led them into the city. The three of them toured London under a blazing hot sun, as speedway fans from across the country gradually poured into the capital. After being kept at the dinner table until 10:30pm the previous night, and being indulged in a rare bottle of wine, Bruce and his girlfriend found themselves being marched around Piccadilly Circus, the Houses of Parliament and all the major tourist attractions. In one of few moments for reflection during the whirlwind day, he nervously nibbled through his lunch in a West End restaurant, with his mind clearly elsewhere. By the afternoon he admits to being completely shattered and severely cursing his manager, but it was just as Adams had planned. By the time Bruce reached the stadium again late in the afternoon, he was focused and ready. He was the first rider changed and set about his sequence of warm-up exercises, while the frenzy of the world final began to build. Adams was never far away, meticulously marking out the programme and always cleverly aware of every possible pitfall and permutation. The mechanical team quietly and efficiently went about their business, and critically, Bruce knew he could place complete faith in his entire back-up team. Although no-one knew it at the time, the meeting would be the last ever World Final at Wembley, often considered speedway's spiritual home. Bruce had some idea what to expect from the atmosphere, having been to the last three finals in London, but still took Adams' early advice to take a walk down the famous tunnel towards the track, and acclimatise to the surroundings with a reported 92,000 people cramming in behind the twin towers. 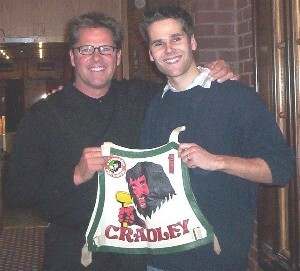 Some reports suggested that there were in the region of a staggering 10,000 Cradley fans present, and it was quite easy to believe it whenever Bruce, or fellow Heathen Erik Gundersen, emerged into view. Any sight of Penhall in particular at the end of the tunnel, either before or during the meeting itself, would trigger a huge wave of camera flashes and by the time the riders were brought out on parade, the noise of the cheers and air horns was positively deafening. The heat of the balmy day was increased another notch when the television crews from both Britain and the USA set up their high-power lights along the pits tunnel, and there was no let up from either group in shoving a microphone under the nose of any rider. Australian referee, Sam Bass, briefed the riders beforehand and assured them that his day job as a senior police detective was ample preparation to deal with any protesting riders, or anyone delaying the start after a single warning. The time had finally arrived for racing.